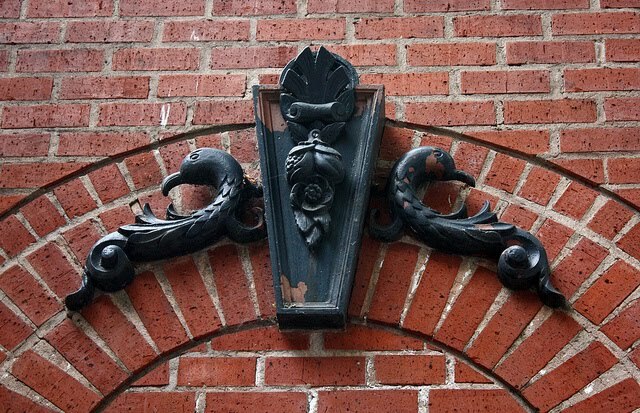 A visit to Old Portland Hardware and Architectural on SE 41st and Division is a chance to view the unexpected re-emergence of a cache from one of Portland's vanished architectural treasures; the Ladd Block (1881) knocked down in a storm of controversy in 1965. The story of its demolition and the dispersal of its pieces is one of reverence and disregard, back and forth, played out over the course of a half century. "Among the edifices particularly worthy of mention are: The three story brick building on the northwest corner of First and Columbia, for Mr. W.S. Ladd. 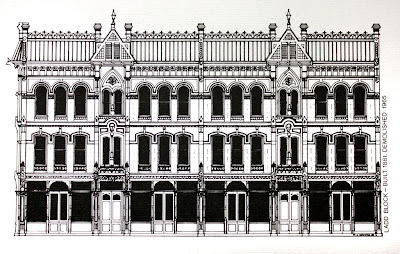 Special pains were taken by the architect, Mr. Justus Krumbein, to make the building equal if not superior in point of strength to any in the city." -The Oregonian, January 1 1882. 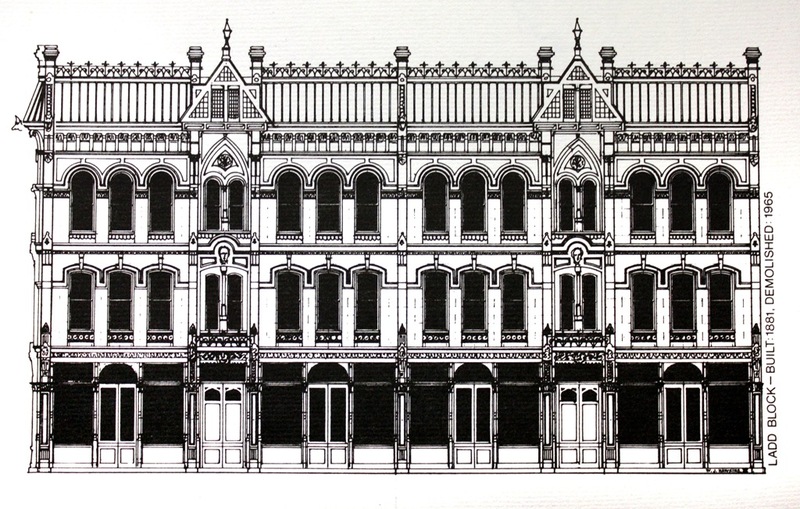 The Ladd Block, drawing by, and courtesy of William Hawkins III. William Sargent Ladd's excursion into what is now called mixed use development was on Columbia, five blocks east of his mansion, and First, nine blocks south of his Ladd & Tilton Bank. On the ground level was space for four retail stores. The second floor held four large residences, laid out in the "French flat" system, each with two bedrooms, a parlor, dining room, kitchen, pantry, bathroom, closets and a separate staircase and exit. The top floor was divided into single rooms and suites for hotel purposes. 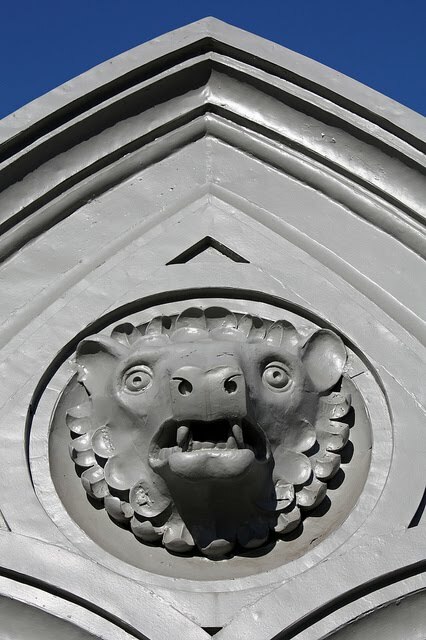 The exterior was styled "modern Gothic" with cast-iron and tin architectural details and a menagerie of wolves, lions and bears standing watch on the upper levels. 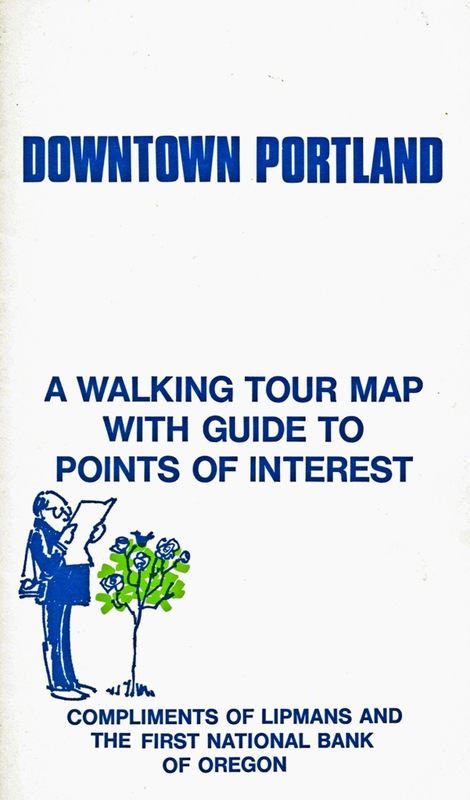 Sturdy, state of the art and fireproof, the Oregonian anticipated that it would still be standing when Portland's population reached five hundred thousand people. In 1891, a hotel, the Ladd House, operated on the upper floors, offering furnished rooms for five dollars a piece and housekeeping rooms for three. In a possible reflection of First street's change in status over the prior decade as downtown moved west, its proprietor, Mary E. Baker, was accused of operating a brothel there in 1895. The hotel closed soon after. 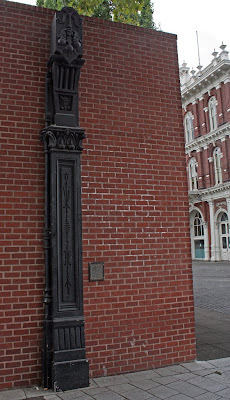 "The Ladd House has the reputation of being a "graft house," a rendezvous for petty thieves and criminal of the lowest type, and particularly as an abiding place for slaves of morphine, cocaine and opium. Worse still, the officers say, that women of the lowest type resort there with male outcasts of society, and together they hold orgies that beggar description." -The Oregonian, April 6 1895. A second hotel, the Villa House, opened on the premises a decade later. Its proprietor, Andrew C. Wald, was succeeded in 1914 by Tojiro Haji, the first of four Japanese-American hoteliers, followed by F.M. Isoshima (1920 to 1926), George K. Kawaguchi (1926 to 1930) and H.K. Uyesugi (1930 to 1942). There is likely a significance to the year of his departure. Over the years various business occupied the store fronts on the ground floor, such as Sam Margulies's Saloon (circa 1911), Victors Cash Grocery (circa 1916) and the American Chili Parlors (circa 1928). 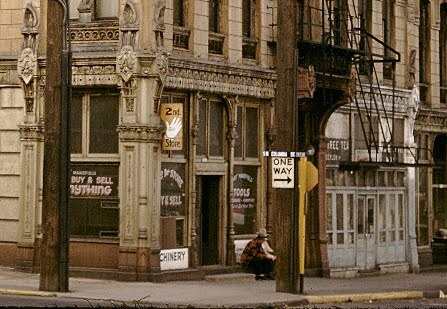 In the 1950s a second hand store occupied the corner storefront at First and Columbia. 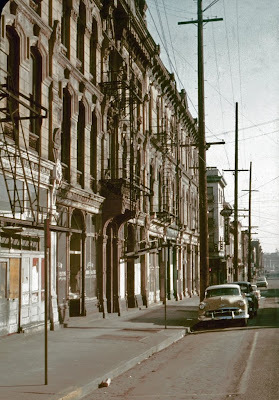 The Ladd Block in the 1950s. 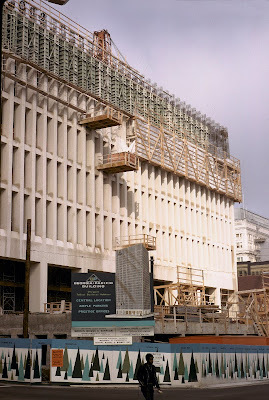 -Marion Dean Ross photo, Building Oregon Collection, University of Oregon. Detail of above, of the second hand store on First and Columbia. 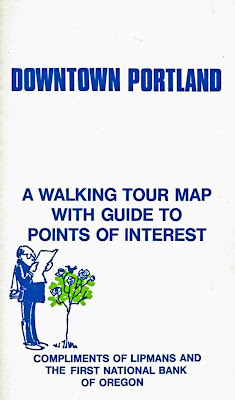 On the once ubiquitous second hand business in the old downtown, Sam Raddon Jr. in the 1946 book Portland Vignettes, wrote: "There is color and atmosphere still, in the district that has seen better times, where the shop-keeper and his friend may sit in the shade of a summer afternoon, and talk of the affairs that effect their own little world. Where business comes from no one pretends to know. But year in and year out the routine goes on. The dust of a generation may seem to have accumulated on stock and trade, but occasionally, at least someone must sell, and someone else must buy." The Villa House closed in 1963. For the next two years the building, owned by the Boyd Coffee Company, sat vacant. The stage was set for one of Portland's most notorious episodes of historic desecration. Drawing in the Oregonian, February 20 1965. 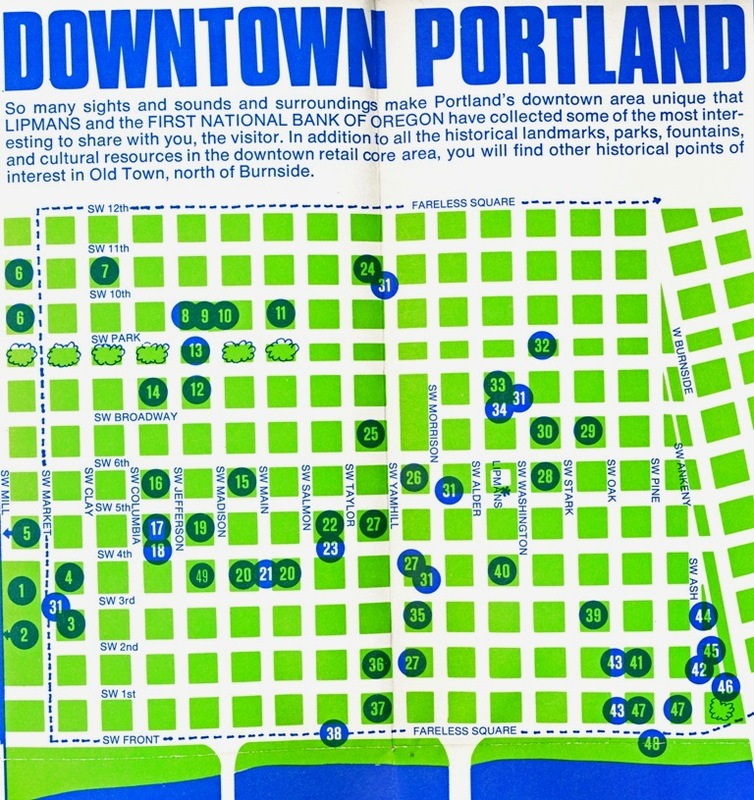 On February 19 1965 the Portland Development Commission released an "area guide plan" for the blocks bounded by SW Front, 4th, Market and Salmon, immediately north of the South Auditorium Urban Renewal project. Unlike the scorched earth approach pursued with South Auditorium, which stripped the district even of its street grid, the "guide plan" proposed some rehabilitation in the existing neighborhood. 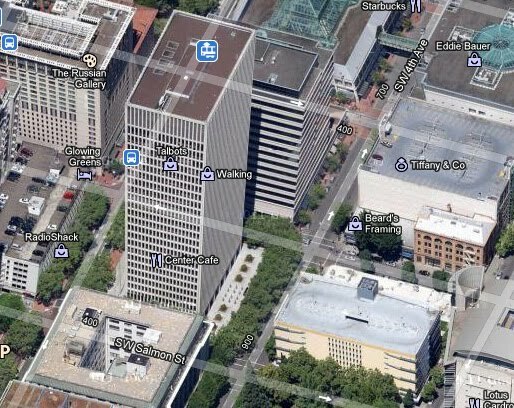 Specifically cited for renovation were the "ancient iron front buildings" the Ladd and Monastes Blocks, on the west side of First, between Columbia and Jefferson. The PDC's suggestion spurred the Boyd Coffee Company, whose office and plant bordered the buildings to the west, to contract with the Western Wrecking Company, to quickly demolish the structures. "Fearing harassment by city agencies, or by concerned citizens, the owners of Boyd Coffee Company, who wanted to make room for a new warehouse, opted for the "midnight disappearance" strategy of demolition. Almost overnight, the half block Ladd building became a paved parking lot." 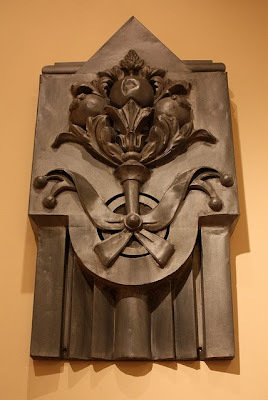 -The Grand Era of Cast-Iron Architecture in Portland Oregon by William Hawkins III. In response to the public outcry over the demolition, Mrs. V.B. Younger, secretary-treasurer of the Boyd Coffee Company, stated the city had ordered the buildings be bought up to code or demolished. Architects had been consulted and the cost to remodel the buildings was found to be prohibitive. She noted that the drawing (above) that had appeared in the Oregonian was for dramatic example, not to be taken literally. "There is no condemnation order against the buildings." -Portland Mayor Terry Shrunk in the Oregonian, March 12 1965. "I resent the fact that the owner appears to passing the onus to the city, by claiming he was ordered to raise the buildings." -Francis J. Murnane, Portland Art Commission in the Oregonian, March 12 1965. 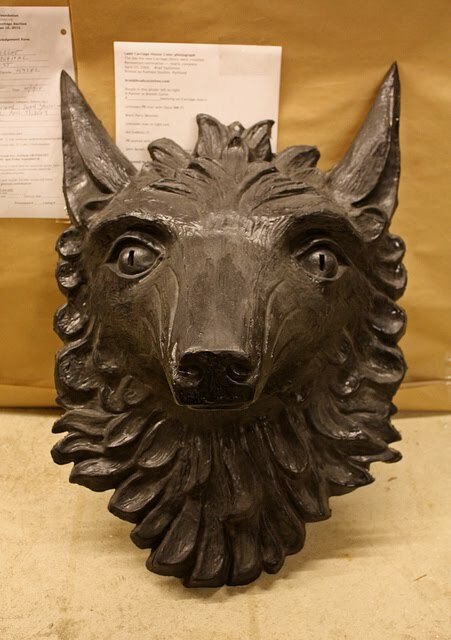 Wolf head ornament from the upper level of the Ladd Block, donated to the Architectural Heritage Center by Christopher Boyd. The long half life of the Ladd Block began when Bob Hazen, President of the Benj. Franklin Savings and Loan, was walking by the demolition site when he noted its metal pieces. With no particular use in mind, he asked a workman if he could purchase some of them. A price of three thousand dollars was agreed upon. They were removed to a warehouse for storage. Ten years later, a use for the pieces was found when the Benj. 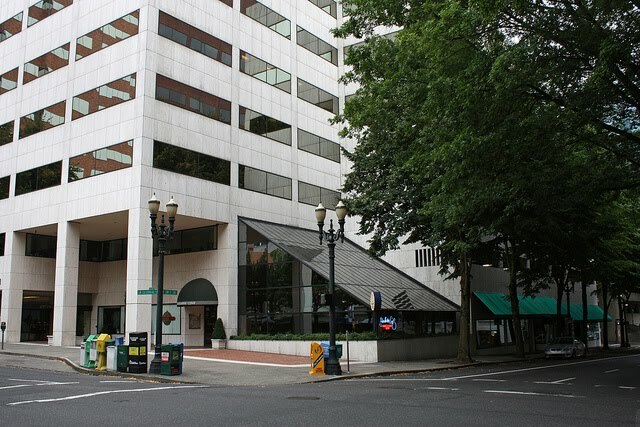 Franklin Savings and Loan purchased a newly completed office tower, across the street on First from the site of the Ladd Block, for its corporate headquarters. 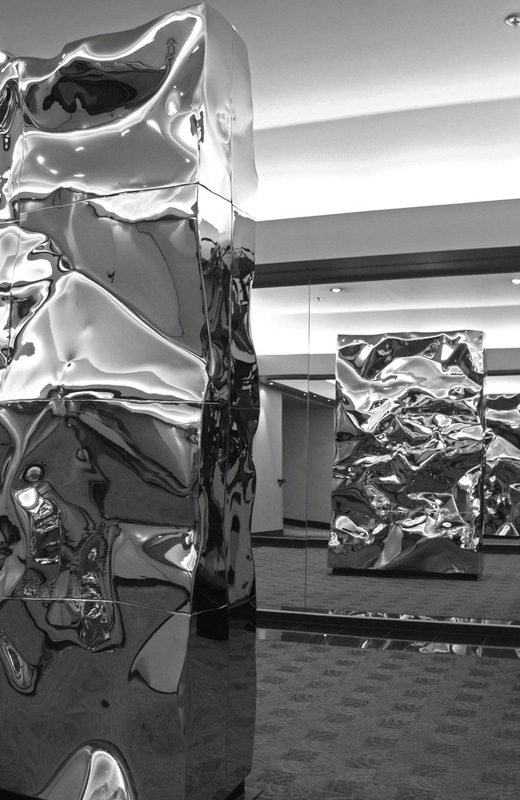 On the top floor Bob Hazen outfitted a luxurious executive suite that utilized the Ladd Block's fixtures. 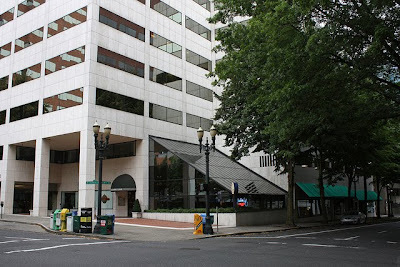 To create his 19th century haven on the 19th floor, Hazen consulted with Portland preservationist Eric Ladd to create a most unlikely office space, complete with a stained glass ceiling from the Washington Hotel, made surplus after most of its lobby was converted into courtyard, and a stairwell mural of the Ladd Block by William Hawkins (from the drawing at the beginning of this post). Decorative tin and ironwork were re-purposed as book cases to surprisingly good effect. A statue of Benjamin Franklin, and a receptionist dressed as Dolly Madison completed the eclectic, if somewhat surreal, scene. The 19th Floor, with ceiling from the Washington Hotel and a column from the Ladd Block. 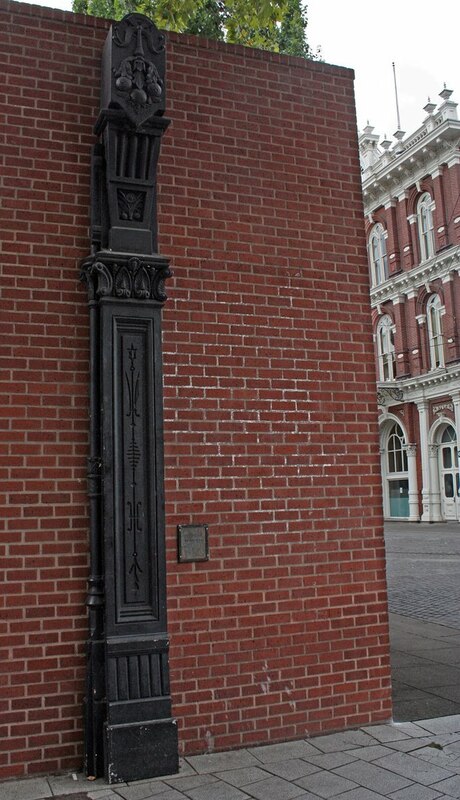 Two years later, in 1977, a column from the Ladd Block, from the Portland's Friends of Cast Iron Architecture's collection, was mounted in the new pedestrian arcade at Ankeny Square which showcased the area's cast iron heritage. When the Benj. Franklin closed in 1990 Bob Hazen's office suite was dismantled with the pieces donated to the Bosco-Milligan Foundation. Some can be seen today in the Architectural Heritage Center's Rebuilding South Portland exhibit. 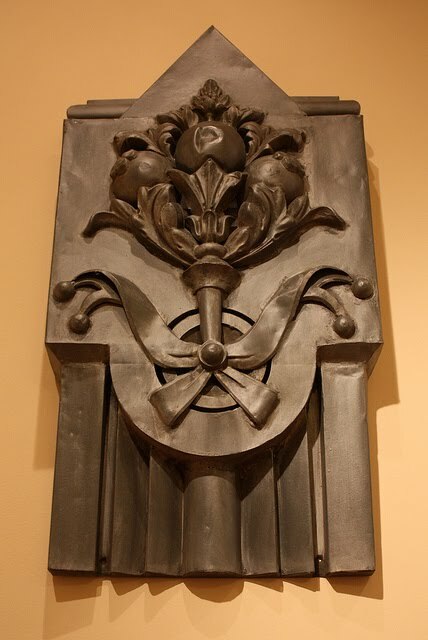 Ladd Block piece at the Architectural Heritage Center. The recently removed courtyard installation in the former Benj. Franklin Plaza. Sadly, the whereabouts of the lions are unknown. Until recently there were remnants of Bob Hazen's cast-iron confection, nearly forgotten, in the 19th floor courtyard and lobby of the building now known at the Umpqua Bank Plaza. It is those pieces that have appeared at Old Portland Hardware after being removed in a recent remodel. Upon being contacted by the project's architect, Bret Hodgert and Scott at Old Portland had very little time to wheel the fixtures, some weighing hundreds of pounds, downstairs to a loading dock, which happily was higher than their flat bed truck. "When I was a kid, I wanted nothing more to be that archeologist in National Geographic. It was kind of like that." -Bret Hodgert of Old Portland Hardware, on obtaining the Ladd Block pieces from the remodel site. 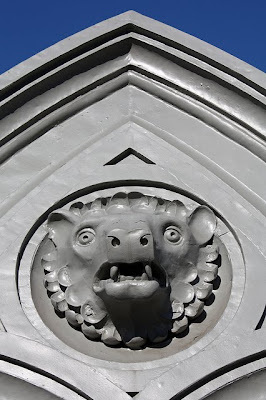 Bear from the Ladd Block at Old Portland Hardware and Architectural. For a short time the Ladd Block pieces can be seen in three places: the Architectural Heritage Center, Ankeny Square and Old Portland Hardware. 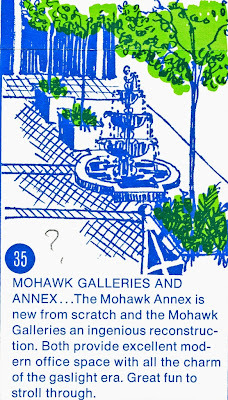 Save for those at AHC their long term status is in flux, as the Old Portland pieces are for sale, and a possible revamp of Ankeny Square, mentioned in 2009, which might replace the current installation with a new twelve columned structure. 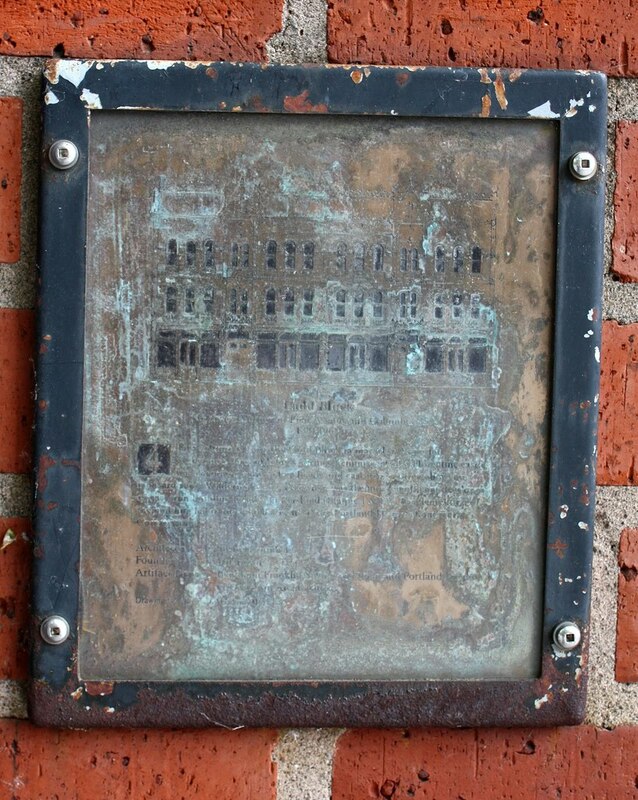 Signage at Ankeny Square, this one describing the Ladd Block has deteriorated badly. 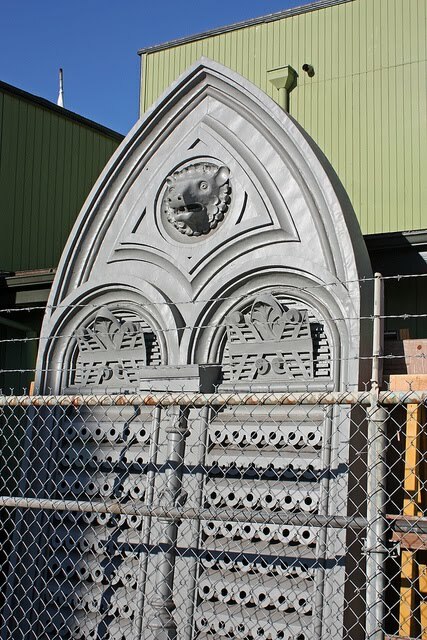 A fence, later added to protect the Fire Fighters exhibit, effectively cut the cast-iron display in half. 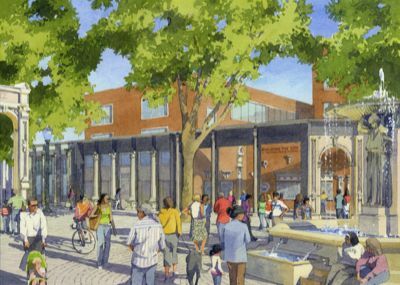 The situation at Ankeny Square symbolizes Portland's relationship with its past, the seesawing between veneration and neglect, with no way to predict the next swing. 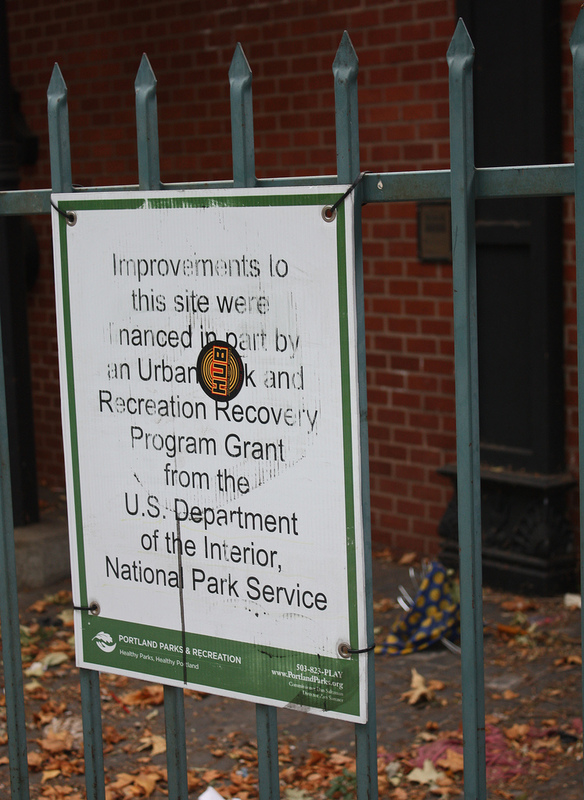 Will the revamp, which might include restrooms and a information kiosk ever take place? 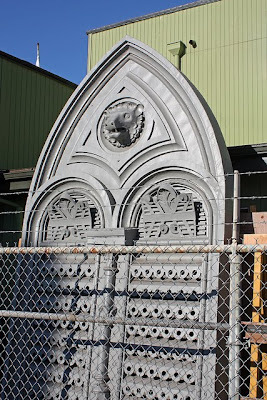 Will the existing cast iron on the wall be removed to storage after the new arcade, essentially a zero sum game, or will the be refurbished (and hopefully repainted in something other that the odd choice of back)? 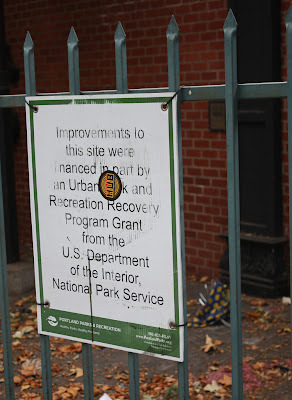 What of the rest of the trove of cast-iron, owned by the PDC, that is stored under a bridge? Forty-six years after after the loss of one of the last major cast-iron building to be demolished, the questions remain on how to best re-purpose Portland's iron age remnants. First and Columbia, site of the Ladd Block, one of the few surface parking lots lost to new construction. 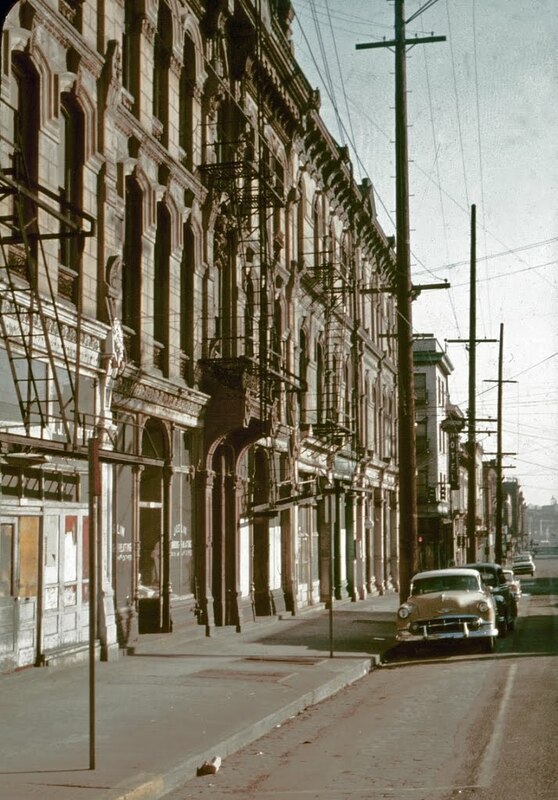 The Ladd and Monastes Blocks, looking north on First from Columbia in the 1950s. -Marion Dean Ross photo, Building Oregon Collection, University of Oregon. 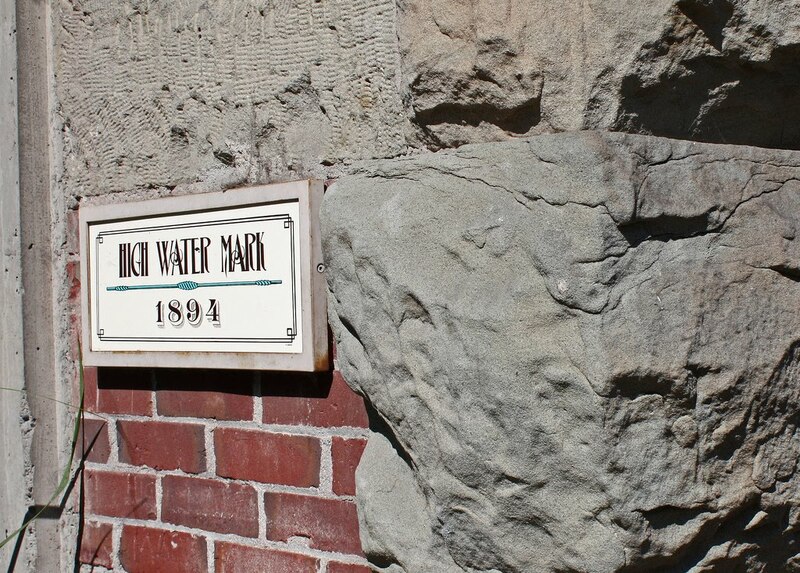 On Monday, October 17 at the Mission Theater at 7:00pm I will be presenting High Water; Portland and the Flood of 1894 for the Oregon Encyclopedia's History Night. 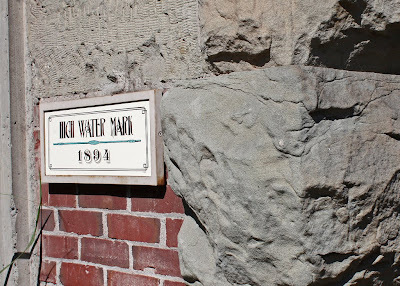 On May 27, 1894, the rising Willamette River began to flow into the streets of Portland. For one month, Portland, already reeling from the financial crash of 1893, was inundated by floodwaters. City life came to a halt, then adapted with flotillas of small boats for shopping and spindly bridges that spanned between second floors. Fire engines were towed through the streets on barges, and the bars moved onto rafts. The receding water left the city a hellish, stinking mess. 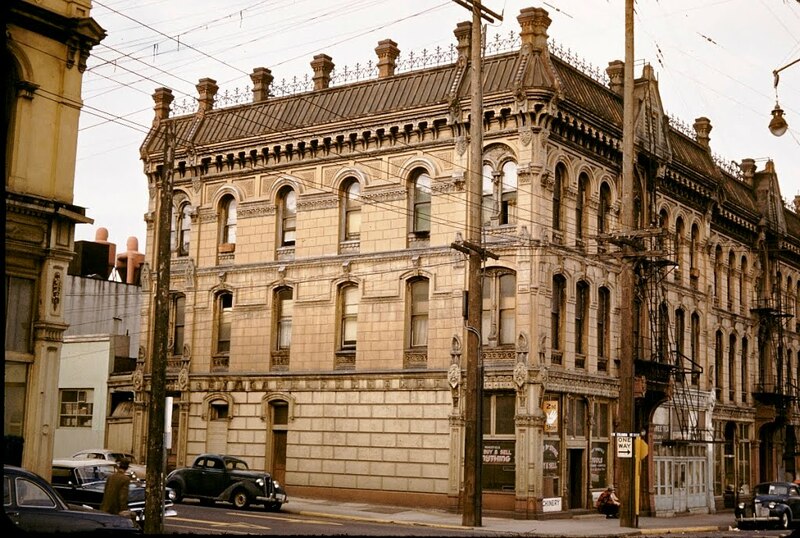 Dan Haneckow explores Portland of the 1890s and its watery ordeal with stunning images of the "Metropolis of the Northwest" as it dealt with one of its greatest challenges.